Fiat Ducato 35 Maxi 2.3 Multijet 130ps Lwb Box / Luton+ Column Tailift Van 6 speed Fwd [ Genuine 7,850 miles from new ] load locking rails, roller shutter door, translucent roof ,abs twin air bags traction control pas electric windows radio Cd central locking dual passenger seat easy clean floor side loading door bulkhead light use, We think its possibly one of the best examples throughout a real credit given to its former user. # Same as CITROEN RELAY / PEUGOET BOXER just different badges and trim # We have one of the best selections Commercial vehicles around 120+ in stock, from the smaller Cdv vans, Mwb, Lwb, Extended Frame,chassis cab,Tipper, Pickups, Double / Crew cab, T/Lifts, Luton / Boxes, Specialist units, Welfare units, Beavertail, Crane / Swing +T/Lift, Caged+ Refuge bodies. Fiat Ducato 335 2.3 Multijet 130 Lwb Low Loader Luton Box Van 6 speed Fwd ex lease service printout,load locking rails, roller shutter door, translucent roof ,abs twin air bags traction control pas electric windows radio Cd central locking dual passenger seat easy clean floor side loading door bulkhead light use, ## AWAITING PREPARATION ## We think its possibly one of the best examples throughout a real credit given to its former user.......We have one of the best selections Commercial vehicles around 120+ in stock, from the smaller Cdv vans, Mwb, Lwb, Extended Frame,chassis cab,Tipper, Pickups, Double / Crew cab, T/Lifts, Luton / Boxes, Specialist units, Welfare units, Beavertail, Crane / Swing +T/Lift, Caged+ Refuge bodies, [ We are family owned and run since 1992 ] + VAT £9,950. + VAT @ 20% = £11,940. 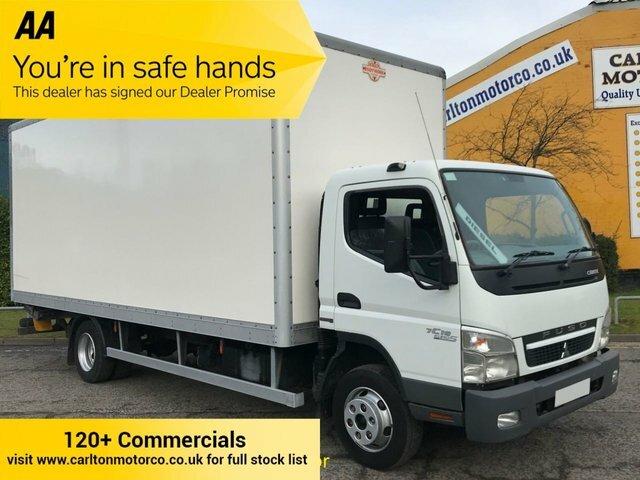 Mitsubishi Fuso Canter 7c15 Euro-5 Box Van+ Tail Lift Grp Body [ Low Mileage ] 7.5ton under slung 6 speed manual box translucent roof non slip floor Barn doors, Digital tachograph 7500kgs gross, Light use, We think you will be hard pushed to find better! !abs electric windows radio-CD dual passenger seat cloth upholstery vinyl flooring, ## 12 MONTHS MOT A POINT OF SALE ## All vehicles prepared to the highest standards also undergo pre Delivery inspection oil and filter, Mot if required Full dealer facilities Low rate finance available The first Dealer to offer Free uk Delivery "We only Got Bigger By being better" We lead the others follow !! [ We are family owned and run since 1992 ] + VAT Every effort has been made to ensure the accuracy of the above information but errors may occur. Please check with a salesperson.